Michael and Paul are busy at the Magic Millions this week - their first visit to the Gold Coast yearling sale for several years - selecting the champions of the future! Purchasing well related youngsters by Lookin At Lucky, Dane Shadow and Fastnet Rock, Michael and Paul are still on the look-out for nice types - so if you are interested please feel free to give the stable a ring (Anthony Feroce on 0412084132). Meanwhile at home the winners have been rolling in with Baqaat and Present Arms both finding the line well at their most recent outings. Appreciating the sting out of the track at Stony Creek on Monday, imported mare Baqaat recorded her second Australian victory and Michael is confident that the best is still to come for the daughter of Alhaarth. "She is probably, finally, acclimatizing now," he said of the six-year-old who appreciated a step up in distance at her third run this preparation. "She had a high white blood cell count after her previous run," Moroney said - excusing her that below par performance. "She is a good, honest mare and we think she is up to city class." Present Arms (pictured) is a horse Michael also has plenty of time for - describing the lightly raced four-year-old as "a nice stayer in the making." At Seymour on Thursday charging down the centre of the track before racing away to a soft 1 1/2 length victory in a 2000m ratings event, Present Arms recorded the second win of his seven start career. "He is a progressive type who will be better again next preparation," Michael said of the Zabeel gelding. 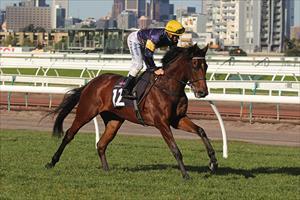 Hopefully the winners continue this weekend, kicking off with Devonshire Duke who heads to Cranbourne on Friday night. Nicely drawn in the fourth race over 2025m with the in-form Ryan Maloney aboard, the five-year-old strips fitter for recent racing and was good in the Italian Plate at Tatura last time out. After jumping from tricky gates at his last couple, Devonshire Duke is drawn to get a good run from barrier four with Michael's only concern being a gap between starts. "He has not raced for a while - but he is going well." We head to Saturday's Flemington meeting with two runners starting with Flashy Fella in the Rain Lover Handicap, the fifth event of the day. His run for sixth in the Listed Bagot Handicap last start was terrific and with a drop in class and distance looks nicely suited. "He was trapped three wide last time and had a pretty tough run," Michael said, "and yet he only just missed out on a placing in a tight finish." "He strips fitter for that run over a bit of distance and he should prove hard to beat." Later in the day we saddle up About Square in the final event, the Tauto Handicap. Sharing topweight of 60kg, the talented four-year-old will be ridden by outstanding highweight rider Steven Arnold. A game first up fourth down the straight, About Square has come on nicely with Michael just hoping for a bit of sting out of the ground. "He does prefer it a bit that way but with his first up run being so good he should prove hard to toss."